What is new in Oxygen HIG 2543? for projects of roughs with Immersion glass. 26 May 2018 - Oxygen HIG 3.26.30 build 2894 is released. We recommend you to update Oxygen HIG to this version of software. Fix of problem with visualization of automatically found glue (in voxel QC mode) upon photos. In some scenarios the reprojections of glue were not shown and the user could not enable reprojection visualization to confirm or reject glue. Fixed the problem when some of saved to disk HIG photos after scanning were too dark. In this technology, Immersion Glass material is used. Immersion Glass is the material having nearly same Refractive Index value as Diamond and is solid at Room temperature and melts to liquid at around 100°C. We can heat Immersion Glass and Diamond in cubical mold so glass and diamond will become a single entity and reflections of inclusions will be removed. Due to absence of reflections, plotting on M-Box is more precise, very easy and can be done by even non-experienced operator. HIG uses 3D model obtained on Helium Rough. HIG makes set of photos with very high depth of sharpness for better viewing of inclusion. Pacor Client - Detecting the most profitable option of rough marking. Oxygen D-Z - D to Z color estimation: Enhancing value while planning/optimizing. 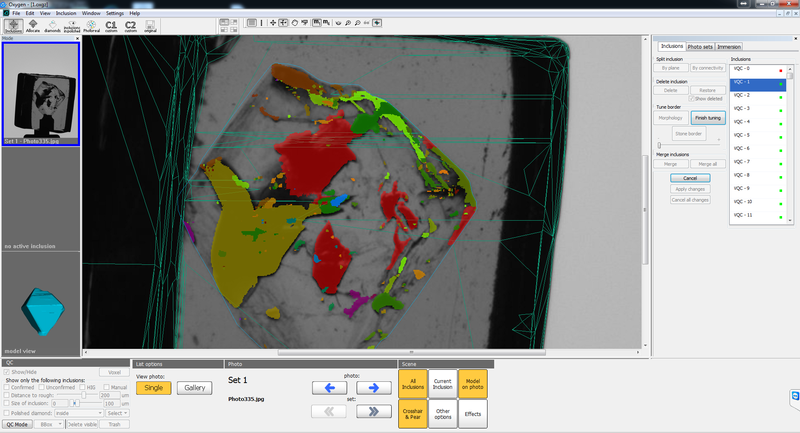 Helium Polish - Scanning 3D Model of diamond. Creating detailed reports. DiBox - Rapid Photography System captures images of polished diamonds under various structured lighting environment and make it ready for Printing or web publishing. DiBox 2.0 - Rapid Photography System captures images and movies of polished diamonds under various structured lighting environment and make it ready for Printing or web publishing. ViBox - The Video Box allows the manufacturer to prepare images and movies 3D for the diamond and diamond jewelry.